Liberia’s First Lady, Mrs. Clar Marie Weah has thanked the staff at the Liberian Embassy near the People’s Republic of China (PRC) for the hard work they’re doing on behalf of the country. “The Government and people of Liberia appreciate all the work that you do here,” she informed the diplomatic and local staff at an acquaintance meeting. According to a dispatch from Beijing, the Liberian First Lady made the comments when she visited the Mission while on a brief visit to China. She indicated that as “First Lady” of Liberia, she’s also hard at work trying to help the disadvantaged people within the society. “One of the reasons we’re here is to appeal to the Chinese because I know they’re supportive of whatever we do to help with my Foundation; I’m here to ask that of them,” Mrs. Clar Weah stated. Mrs. Weah noted that she has set up the “Clar Hope Foundation” and her goal is to improve the living conditions of both urban and rural women, increase the income of rural women through agriculture; rehabilitate, educate and train young boys and girls that are on the streets of Liberia. She named the targeted groups as women, the elderly, orphans, special need children as well as wayward young youth. She promised to make his dream a reality and outlined plans to build a facility to be called “City of Hope”, which will consist of a home for disadvantaged children, a rehabilitation center for girls from the street, a school, shelters for orphans and a feeding program for the elderly. First Lady Weah thanked the staff for the warm welcome; praised the close relations and how supportive China continues to be to the Government and people of Liberia. 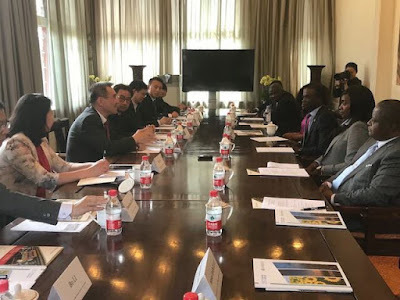 Speaking earlier, Ambassador Dudley McKinley Thomas warmly welcomed the First Lady and delegation to Beijing, noting that the visit is symbolic of the strong relationship that exists between the People’s Republic of China and Liberia. “I know your visit serves the interest of the Government and people of Liberia and will add to the strength and further cooperation between both countries,” Ambassador Thomas indicated, wishing the delegation success on their mission. He reminded the First Lady that the Embassy remains at her complete disposal. Ambassador Thomas reassured Mrs. Weah that Mission in China is cognizant of the good work started in the country. He promised that the Embassy will do its part in promoting that agenda in reaching out to see how they can resource and support the foundation with their work.